Here’s a fun stencil that I made for my son. 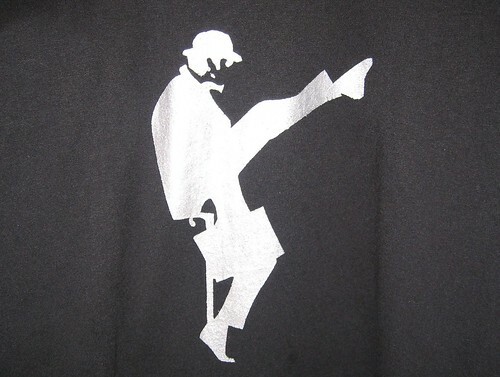 It’s a fairly simple stencil and a great conversation starter! My family are huge Monty Python fans, so much so, that I ended up making a shirt for my hubby,too. In lieu of individual photos of the process, take a look at my how-to video for stenciling, which you may remember from this post or from The Cullen Crest post. Pre-wash t-shirt without fabric softener. Print stencil (or alternative updated version) onto freezer paper (matte side). Carefully cut out with an exact-o knife. There are loads of fiddly bits, so take your time and be careful. Place cardboard or newspaper inside t-shirt. Place stencil on t-shirt with a piece of blank paper on top (that keeps the tiny pieces in place) then carefully press with the iron. Use the foam brush to gently paint on the fabric paint. Allow a few minutes to dry, then carefully remove the stencil. For small pieces, use a straight pin to help get them started for easier removal. Finish drying according to manufacturer’s directions. 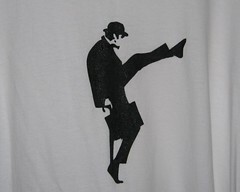 This entry was posted in hand crafts, stenciling and tagged hand crafts, monty python, silly walks, stencil, stenciling, t-shirt on December 29, 2008 by Jennifer Ofenstein. ‘just’ a year and a half later I made my brother an apron with your stencil. I’m eagerly waiting for the paint to dry! I can’t wait to see how it turned out. I wish I’d done this sooner…..VERY easy, your stencil is large enough that it makes it easy to work with. I’ll be posting it on my blog next week so come see how it turned out. Better late than never! I’m excited to see how it turned out. My hubby and son still wear these shirts allll the time!